Globally, fisheries are targeting fish that occupy a lower trophic level in the food web. This can have severe implications for many seabirds as illustrated by declines in the Kittiwake population breeding on the Isle of May, Scotland. In the North Sea, the systematic overfishing of cod, mackerel and herring is thought to have relaxed the pressure on one of their prey species—the sandeel—causing a big upsurge in the abundance of this fish in the 1950s. This in turn spawned a major industrial fishery for sandeel for processing into fish meal and oil. By the 1990s, annual landings of sandeel were approaching one million tonnes, making it by far the biggest single-species fishery in the North Sea. In 1990, a summer fishery for sandeels started off the east coast of Scotland near a major seabird breeding colony, the Isle of May. Catches of fish near the island peaked at 100,000 tonnes in 1993. Research has shown that fishing on this scale almost certainly depleted the local sandeel supply for seabirds, especially the surface-feeding kittiwakes which, unlike auks and shags, had no opportunity to forage deep in the water column. The kittiwake population declined relentlessly, due not only to poor breeding success but also reduced adult survival. 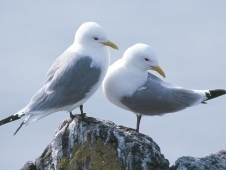 In 2000, in a pioneering use of a seabird as an indicator species for a fishery, the plight of the kittiwake was central to sandeel fishing being banned from 20,000 km2 of sea off east Scotland, including the waters around the Isle of May. Since then, however, the kittiwake and other seabirds, as well as the fishermen, have continued to suffer sandeel shortages, thought to be caused by climate change disrupting the plankton community at the base of the food chain (Furness 2002, Frederiksen et al. 2004, Daunt et al. 2008). This switch to targeting small prey fish reflects a global trend in landings from long-lived predatory fish towards short-lived fish and occupying a lower trophic level in the food web (Pauly et al. 1998). The same trend has also led to exploitation of invertebrates such as krill in the Southern Ocean, recent increases in which have potential implications for penguins, some albatross species and other seabirds (Croxall and Nicol 2004, Kock et al. 2007). Croxall, J. P. and Nicol, S. (2004) Management of Southern Ocean resources: global forces and future sustainability. Antarct. Sci. 16: 569–584. Daunt, F., Wanless, S., Greenstreet, S. P. R., Jensen, H., Hamer, K. C. and Harris, M. P. (2008) The impact of the sandeel fishery closure on seabird consumption, distribution, and productivity in the northwestern North Sea. Can. J. Fish. Aquat. Sci. 65: 362–381. Frederiksen, M., Wanless, S., Harris, M. P., Rothery, P. and Wilson, L. J. (2004) The role of industrial fishery and oceanographic change on the decline of North Sea black-legged kittiwakes. J. Appl. Ecol. 41: 1129–1139. Furness, R. W. (2002) Management implications of interactions between fisheries and sandeel-dependent seabirds and seals in the North Sea. ICES J. Mar. Sci. 59: 261–269. Kock, K.-H., Reid, K., Croxall, J. P. and Nicol, S. (2007) Fisheries in the Southern Ocean – an ecosystem approach. Phil. Trans. R. Soc. Lond. 362: 2333–2349. Pauly, D., Christensen, V., Dalsgaard, J., Froese, R. and Torres Jr, F. (1998) Fishing down marine food webs. Science 279: 860–863.